I was a speaker at last years EuroSTAR and I am still enthusiastic and proud to have been there. Being a speaker adds very much to the experience and since I believe I have still more to share with the community I plan to enter for a talk in this years event. Something I can recommend to everybody willing to learn, share and invest the necessary time. Sending in a good abstract is however not so easy and needs next to having a good idea also the ability to write a good proposal. Last December, to share how we managed to write proposals that allowed us to go to many of conferences as a speaker Huib Schoots, Derk-Jan de Grood and I held a short workshop on proposal writing. Derk-Jan wrote a small blog post about it. I am continuing some of that effort in this post. Last week Anne-Marie Charrett was so kind to review one my proposals and give me some good tips. During that session I also showed her a mind map that I had made in while preparing. At some point during our session she pointed out to me that perhaps it was a good idea to share the mind map with the community. I hadn’t really thought of it myself but it immediately struck me as a good idea. So to help you on your way, and even at the risk of bringing in competition, I would like to share with you the mind map that I made while preparing my proposal. It summarizes the information that Michael Bolton and Allan Richardson shared on writing an abstract. So good luck and maybe see you there! Seven Questions – What will I test? In the previous post I addressed why you test. In this post I will address what you are going to test. In the sections below I will hand you a number of ideas. Some of them are well-known in main stream testing and other may be a bit more out of the box to some of you. Followers of this approach do admit that requirements, or rather documents, are hardly ever complete and that testers almost never have the possibility to design and execute all possible tests. This last insight is the foundation of an approach called Risked Based Testing (or sometimes called risk and requirements based testing). You can find more information on it here, here, and slightly more hidden in here. But personally I like this interpretation of risk based testing, by J. Bach, best. A major advantage of risk based testing, and in my opinion essential in finding out what to test, is that it is based not only on documents as a source, but that it is based on people as a source of information. People are a major source of requirements and especially of requirements that matter to them. Documents can tell you a lot, but people can tell you what’s missing in them, how to give meaning to them and therefore paint you a more complete picture. A good source of information, besides risks, that people can also give is how they current software or the manual operation that they use to solve the problem now. Often this will be the basis for the acceptance criteria that they formulated, or that you will formulate together with them for the new software. Acceptance criteria are useful to give direction and focus to your testing and are mandatory elements in the structure of your testing report. Finding out what to test is not only about bringing the subject under test and its information to you the tester. It is also about what you bring to the subject. What knowledge of the domain do you already have? What test ideas or mnemonics do you know that are useful in the context of your subject? The list below has some online sources you can use and fit into your situation. Use them, adjust them and come up with your own ideas. There are many definitions for a test case. My personal one is: “A test case is the execution-able version of a test idea. 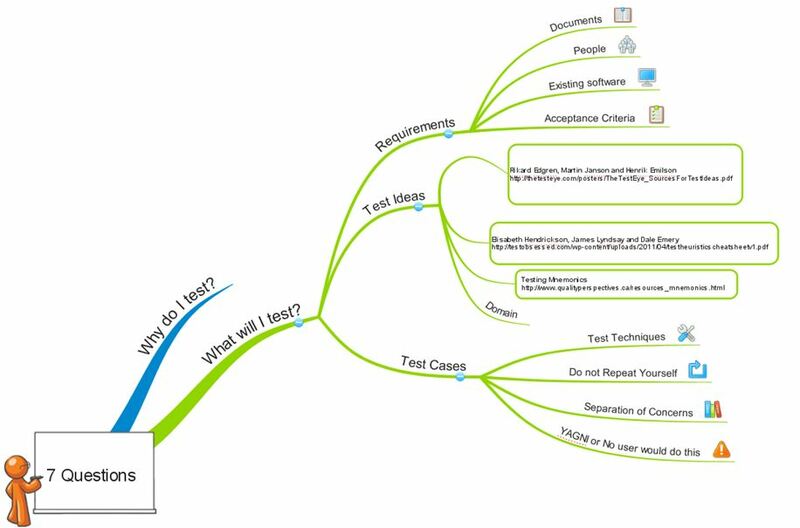 A test case aims at gathering information about the test ideas relation to the subject under test and the value of that information to the stakeholders.” If and how much of a test case is (pre-)scripted is based upon personal preferences, the test idea itself and the context in which it is executed. Attention should in any case not go towards the quality of scripting of a test case, but towards the relevance and value of the information that is delivered by the test case. When working on test cases there are a few principles that I like to keep in mind. The DRY principle. DRY stands for “Do not Repeat Yourself”. If test cases draw their value based on the information they offer it is not useful to use variations of tests that do not deliver new information. This principle does have a catch as you do not always know in advance if a variation does or does not deliver new information or not. Separation of concerns is another principle that lets you focus your attention upon some (single) aspect. This does not mean that the other aspects are ignored. It means that you address the subject under test with a singular point of view, deeming the other’s irrelevant at that point in time while not forgetting that relationships might exist. Finally I am always interested in mentions like “You Ain’t Going to Need It” (YAGNI) or “No user would do that” popping up in any design discussion between other team members. The areas discussed are an interesting area to start investigating. This concludes this third post of the Seven Questions series. Seven Questions – Why do I test? The question why something is tested has kind of a schizophrenic nature to it. Its answer is either so obvious that the question itself is ignored or it is so cumbersome that testers rather avoid to answer it. The latter is mostly the case if testers have to defend why testing is done in the first place. I cannot provide you with ready made answers for this, because the answer depends too much on the circumstances and context of your situation. What I can tell you is that it is worth while for you to figure out why your specific subject under test needs testing. If you can answer this for your specific situation, then the contextually acceptable general answer should be able to be derived from it. 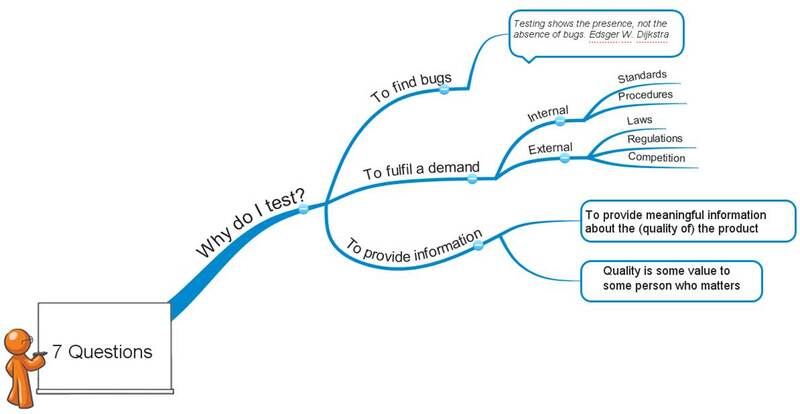 One of the more common ideas on why software testing is conducted is that it’s done to find bugs. 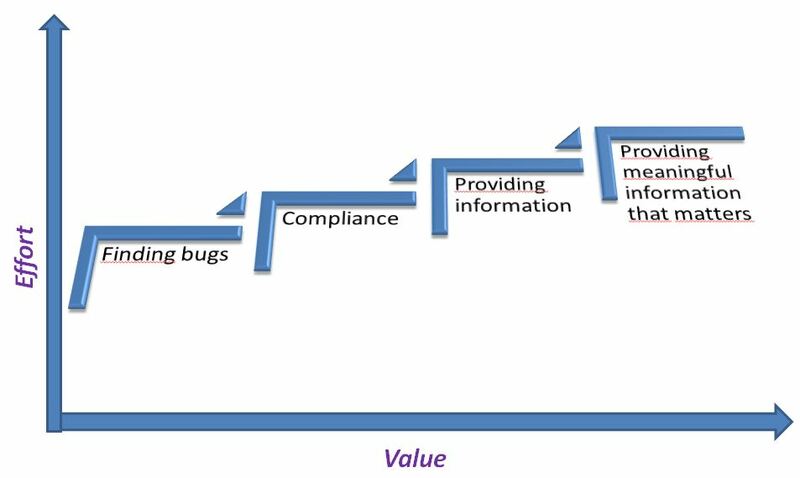 The idea is that the fact that you do or do not find more then a certain amount of bugs in time is a measurement for release readiness. Obviously such a amount of bugs doesn’t say anything about how serious the remaining bugs are nor does it say anything about the bugs you did not find. Already more than 40 years ago Edsger W. Dijkstra (1969 p.16 and 1970) discovered that software testing can show the presence of bugs, but never their absence . Another reason to do software testing is that there is some internal or external reason to do it. A standard, law or regulation exists that either states that you have to test or whose interpretation makes management believe that you should do tests, often in a certain predefined way, to meet the rules. This is not a bad thing as an external reason for testing. A better, more internal, reason for testing is that the software is tested to provide information. Better still Information that is meaningful with regard to the product itself, its intended use, its real use, its potential (miss)use and related to the value this has to which stakeholders. It is your challenge as a tester to find out what the information is that the stakeholders value. Then extend this with the information they should value, even if for reasons thus far unknown to them. And finally to find a way how to provide that information so that its relevance and value is delivered to them in a meaningful way. With some well-directed extra effort the value of testing can grow. Both to the tester and to the stakeholders. Way back in 1998, with the introduction of the Euro to the financial markets I came in contact with software testing for the first time. As a business acceptance tester I was responsible of judging whether the new programs actually had the desired functionality and if we could work with them. Especially that latter part had the focus of my attention. Being one of the users myself and being involved in the requirements design of the product I found it easy to understand why this had to be tested and what value to look for. More often than not software testers are not so familiar with the everyday practical needs and demands of the product they are working on. In this case I have two approaches that I prefer to use and that have served me well in the past. The first is to approach testing heuristically, with for instance the Heuristic Test Strategy Model, and explore the product with helpful mnemonics like FEW HICCUPPS . The second approach is to converse and to keep on conversing with the stakeholders and ask them all they need to know. Who else would know better what matters to them than the people who matter (to the product and/or the project) themselves. Why do I test, summarized. 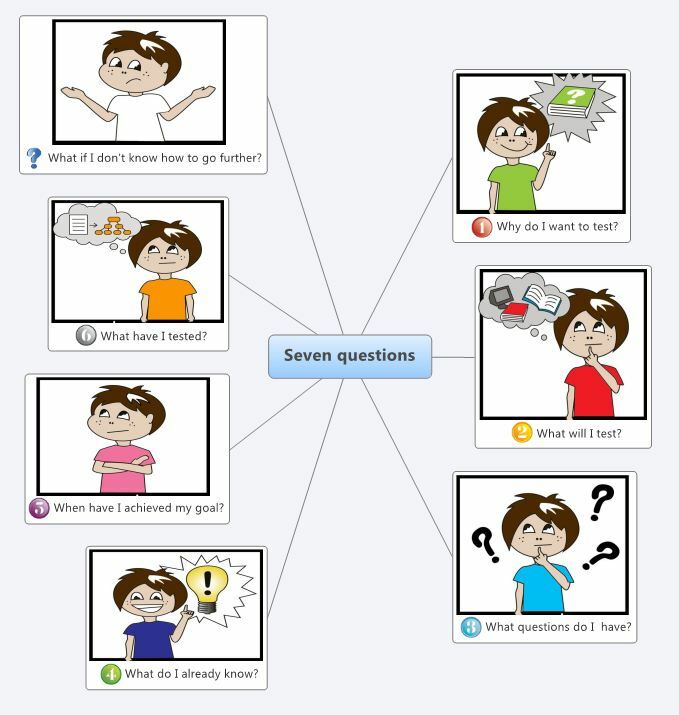 This is the opening blog of a small series of posts in which I elaborate on a test approach heuristic using 7 questions that I have developed over the years. I admit that both TMap and ISTQB (initially) helped to give testing a positive foothold in many organisations and have underlined that testing should get its place in software development. Even so the five elements I have described above should also show that there are fundamental flaws in how these approaches apply testing. Following them does not guarantee you to get fully involved into software development nor does it teach you how to test in practice. Usually as a compensation for these flaws testers go to boot camp like courses to teach them more practical testing skills, like determining test coverage and applying test design techniques. Even so for many testers the start-up of their professional life is focused on getting the certification and maybe some introduction to actual testing. And then….well…..for of them most it ends here and they go out to work and follow the processes and deliver a bunch of documents. If your new to software testing this will probably keep you busy for a while, but eventually you (should) start to ask yourself questions like: Is there no better way to test this? Do I really have to write these elaborate test plans / test scripts / test cases that nobody seems to really care about? Why don’t the developers agree with me on my defects? Why is my work not valued? I have asked myself these and similar questions and over the years I have come up with a set of alternative questions whose answers guide me through a development / test cycle. These questions demand creativity, knowledge and skilled experience to answer them. And any answer you can come up with this time will differ the next time you ask yourself that same question again. 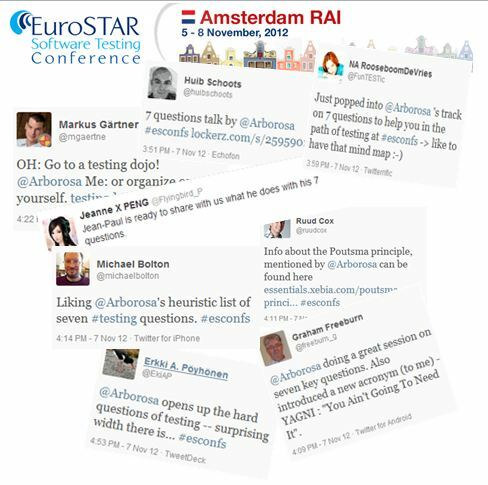 I have done a talk on these seven questions at EuroSTAR 2012 and will do the at Belgium Testing Days 2013. Contact me there if you want to meet and talk, or sent me a tweet @arborosa .